The new Premier League season has kicked off to the usual fanfare, but another battle is raging off the pitch, between rival broadcasters Sky Sports and BT Sport. Both companies have launched high profile advertising campaigns, in order to win over new subscribers. Sky have opted for a nostalgic look back at seasons gone by, integrating Thierry Henry into clips of memorable moments. BT Sport have taken a more glitzy approach, with their ad focussing on a house party featuring some of the world’s best players, in an attempt to draw attention to their newly acquired Champions League offering. Both ads have been complimented by accompanying outdoor posters, radio spots and social media activity. YouGov BrandIndex data point towards the cut-through both campaigns have achieved. Since July, our data points towards how closely contested the battle has been. 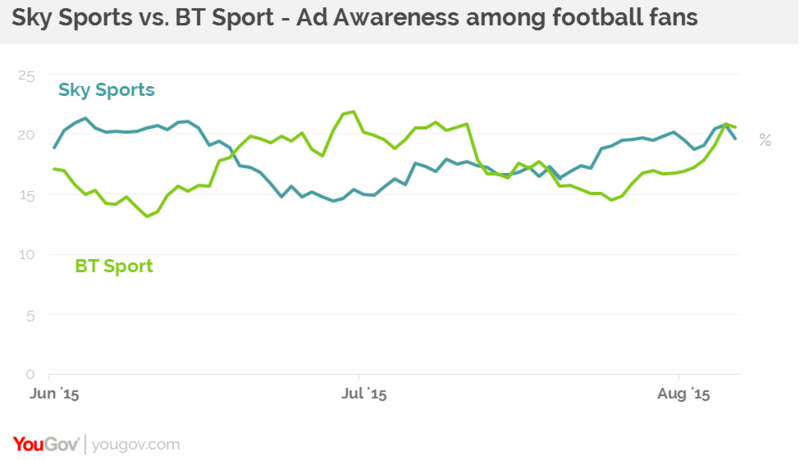 Currently YouGov’s Ad Awareness shows that Sky Sports is narrowly ahead among all respondents on +16.5 compared to BT Sport’s +15.8. There is a slightly different picture among those on our panel who proclaim to be football fans. 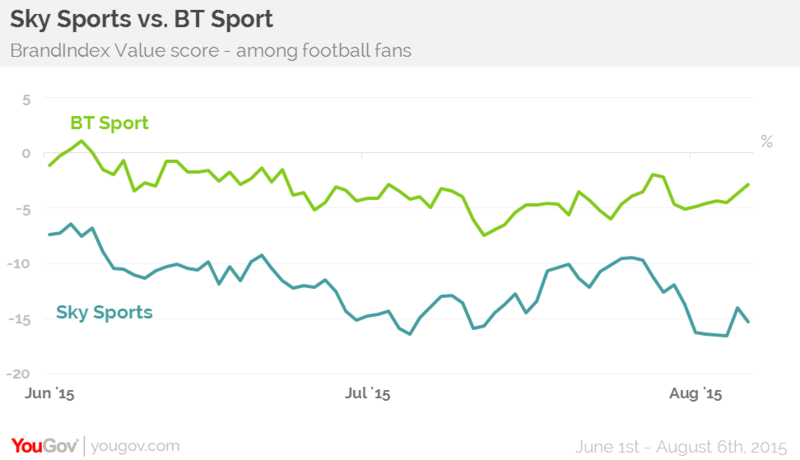 BT are slightly ahead at this point, with their score of 20.6 slightly ahead of Sky 19.7. The true test of course, is how this increased ad awareness and visibility translates into new subscriptions and customer satisfaction. One crucial aspect to this is perceived value for money. On this measure, among football fans at least, Sky Sports are losing out. 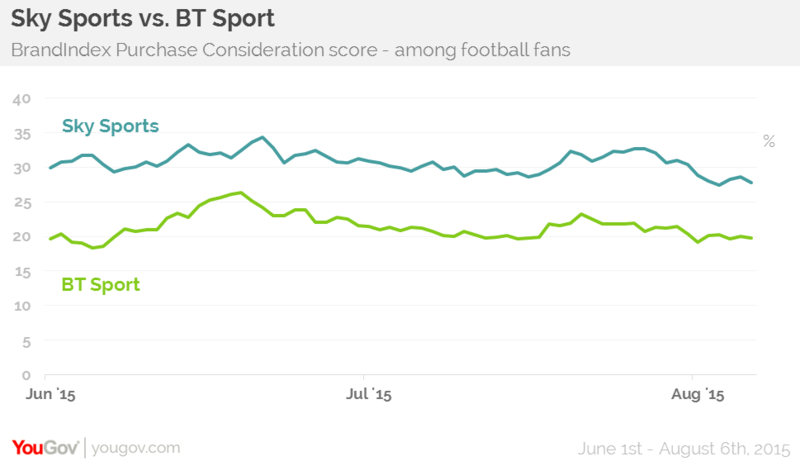 Their Value metric score is an unhealthy -15.3, compared to BT Sport’s -2.8. The saving grace for Sky Sports as far as our data is concerned comes in the form of our Purchase Consideration Metric, they lead on this measure +27.8 to 19.7 among football fans. Of course, Sky Sports has been synonymous with the Premier League since its inception, and still possesses a dramatic hold on the market. However, our data does reflect the strides BT are making, whether its aggressive move to secure European football rights will see it really seen as an equal by supporters remains to be seen.